Remove the guard from the entrance of Ashamul to help a smuggler. Travel to Ashamul and speak to Feduran Vandal about hiring a pack guar. Travel to either Tel Ouada or Ranyon-ruhn to look a for a guar thief. Traveling to Ranyon-ruhn yields no help as Galdasi refuses to be the thief. Once you arrive in Tel Ouada, talk to someone about guar thefts. Travel to Tel Ouada's Guar Farm where Erdlan Galelan tells you some slaves at a nearby plantation saw lights east of the guar Farm; travel directly east across the water until you find the cave Kalishlapal. Once inside, find Garas Diren and slay him; once dead go upstairs and take the order form as proof that you killed him. Return to Ashamal to talk to Feduran Vandal who tells you to talk to the guard outside. Talking to the guard is a fruitless effort as the guard refuses to leave without proof; snitch on Feduran and the guard will give you the guard for free. OR show the guard the order form as proof and he will leave. Once you have made arrangements for the guar, return to Master Mithras and he will reward you with 150 gold. 1 Apparently Feduran Vandal has been acting jumpy lately. The villagers of Ashamul think it may have something to with the guard posted at the entrance. 10 Feduran Vandal at Ashamul tells me that she is a smuggler, and wants to get the guard posted at the entrance of Ashamul out of the way, in a manner that will not cause Master Mithras to send more. 15 Finishes quest I refused to help Feduran in her immoral deeds. Perhaps I could report her to the guard? 20 When I agreed to help Feduran, she told me her cunning plan. She can't do anything suspicious, so she needs me to help her. To do this, I must find the guar thief, so Mithras has no excuse to keep his guard at Ashamul. 21 When I agreed to help Feduran, she told me her cunning plan. She can't do anything suspicious, so she needs me to help her. To do this, I must find the guar thief, so Mithras has no excuse to keep his guard at Ashamul. There is an alternative to finding the thief, however. Feduran has heard of the goings on at Ranyon-ruhn, and thinks I could pretend that Sinsal Nedriem, the slanderous alchemist, was the guar thief. 40 I found the guar thief, and slew him. I should report this to the guard at Ashamul; Feduran in the Ashamul caves is also likely to be pleased to hear of my success. 50 I was able to convince the guard that I had slain the guar thief. I should inform Feduran Vandal of my success. 51 I was able to convince the guard that Sinsal Nedriem was the guar thief. I should inform Feduran Vandal of my success. 60 Finishes quest Feduran Vandal thanked me for removing the guard from Ashamul. 70 Finishes quest I reported Feduran's scheme to a guard, who said he'd have her promptly arrested. He rewarded me for my honesty. 80 Finishes quest I killed Feduran Vandal. 10 Feduran Vandal suggests two places where I might look for the guar thief. Her primary suspect is Galdasi Thendas, a thief at Ranyon-ruhn. While she is a poor thief, Feduran thinks it might be easier for her to steal something that would follow her. Alternatively, I could try asking around Tel Ouada, where there have also been rumors of guar theft. 10 At the Tel Ouada guar farm, Erdlan Galelan told me that he'd lost a few guars to thieves recently. 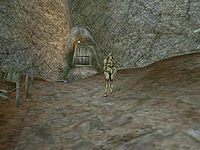 Apparently, there had been lights seen at the base of the cliff at Aegondo Point, east of the guar farm, on the night of the last theft. 20 Erdlan Galelan thanked me for killing the guar thief. This page was last modified on 16 March 2019, at 23:59.